At this point I think I'll ferment just about anything! 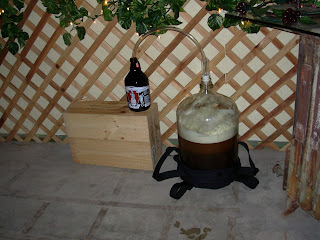 I've been reading a lot of homebrew forums and EdWort at Homebrewtalk posted this recipe for German hard apple cider, or Apfelwein. It seemed so easy that I thought I should give it a shot. Here's how the "brew day" went. 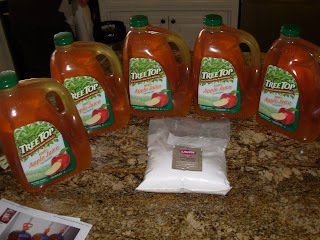 Here are the ingredients for this fermented coctail: 5 galons of natural, pasturized apple juice from Costco, of course. 2 lbs of corn sugar, and 1 packet of dry yeast. You're supposed to use Red Star Montrachet, but Wayne at Barley and Wine didn't have any. He recommended Lavlin #EC-1118 Champagne Wine Yeast for the same clean, crisp, dry finish that the Montrachet would have produced. Here is the finished product with my son in the background hamming it up! It's mighty clear for a "brew day" concoction. Here's a picture of the Apfelwein in my "new to me" fermentation chamber! Applause!!!!!!!!! My son and I just picked this up today in Turlock for as close to nothing as you can get. This stuff will sit in this chest freezer (with temp controller of course) at 70 degrees for the next 6 weeks. 6 weeks? Yup, 6 weeks. 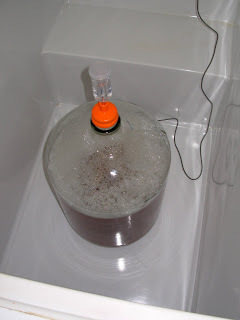 It ferments slow and should finish out at around 0.999 on the hydrometer or at just about 8.13 ABV. Yikes, that's some serious alcohol. I might just have to invite Mark over to help drink this stuff! And, no, I haven't built the kegerator yet. I may have to wait until next month to buy the chest freezer. 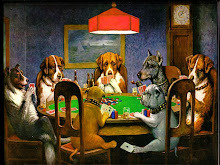 I've got a broken window to fix on one of our french doors and that ate up quite a bit of funds! 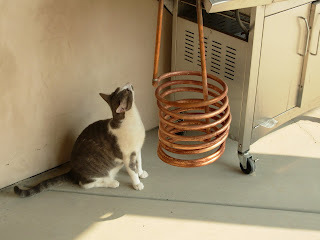 Here's Oliver (Ollie) the brew cat checking out the wort chiller. Here's my first yeast starter on my homemade stir plate. It's looking mighty lovely! I lit the burner and started heating my strike water at 8:15 am. UPS has not yet delivered my grains/hops for this brew, but I think they'll be here by 11:00. I heated the water early knowing it wouldn't lose too much temp by the time the grains got here. It's going to be a hot one today (104) so I'm brewing in my bathing suit (Semi-No Pants?). Several trips to the pool will be required to stay cool! 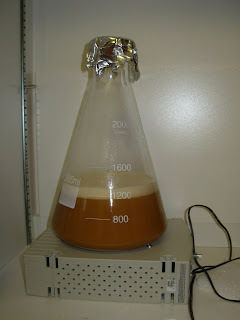 Yeast Nutrients @ 10 Minutes - Helping the yeasties do their job! 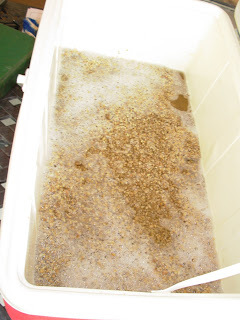 When mashing in lately the ProMash calculations for strike water temperature have been low making me miss my mash temp. ProMash recommended 163 for strike water temp, I adjusted up to 168/169. 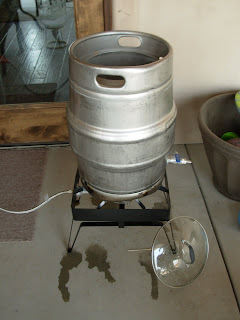 I put the strike water in the mashtun, added the grain and 1 tsp of 5.2 and nailed my mash temp at 154! Woohoo! Keeping the heat in for 60 minutes! The mash went well. I only lost 2 degrees over an hour. The mashout went very well also. 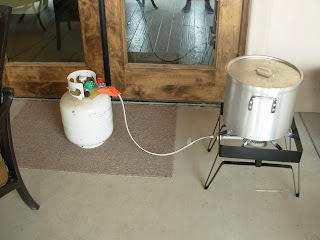 I got 5 gallons from my first runnings and 2 gallons from my second. Seems that I over mashed just a tad! Draining the first runnings into the boil kettle after recirculating 4 times to get the grain bed to settle and the wort to run clear. Woe is me! I turned my back to the boil kettle for a few minutes and had a nice (OK, not so nice) boilover. Sticky wort on the concrete is not what I wanted to be working around today especially because I'm not wearing any shoes! Oops! I must have misjudged the pre-boil volume of wort. 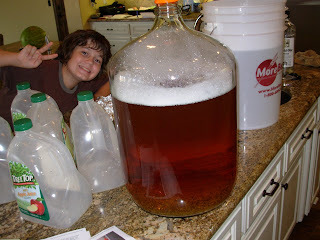 I only ended up with 4 gallons post boil. About 3.75 will make that into the keg. 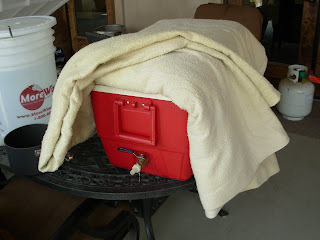 :-( So much for me being comfortable with my brewing techniques! From now on I'm going to sparge into a measuring bucket so I'm right on with my wort amounts. Last time too much, this time too little, sheesh! 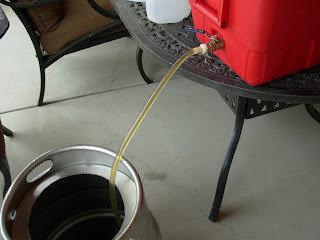 Sweet wort being transferred from the boil kettle to the carboy for fermentation! Here's the wort's resting place for the next three weeks: In the basement of my wife's office. It's been warm outside so I suspect this is going to ferment a little higher than 63 degrees, probably more like 68. Still in the good beer zone! Edit: I missed my OG by 6 points. It was 1.054 and the range for this beer is 1.060 - 1.065. I've always had low efficiency on this system. Time to get a new cooler for a mashtun (this one's all bubbled up on the inside from the hot water) and start crushing my own grain to see if that helps. 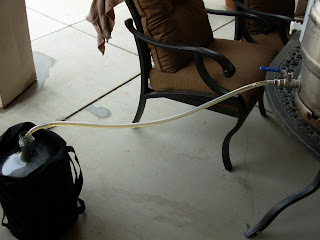 Still, the gravity sample tasted mighty good! Up next: Hopefully the kegerator! I have all the parts except the chest freezer and the temp controller. Morebeer will have the temp controller available 7/18 and I'm just hoping Craigslist comes up with a freezer for cheap!